Fig. 1. Anavatos on Chios (photo: D. Maggana). Anavatos is a medieval fortress settlement situated in the centre of the island of Chios. Its particular character stems from a multitude of features of both a historical, architectural and town planning interest. To the people of Chios, it is part of their identity and a place of remembrance, while in situ studies taking place over the last decades aim at preserving the structures and restoring Anavatos’ appearance and historical character (fig. 5). The basic principles of this survey are based on André Malraux’s (note 1) description of the concept of a cultural-development park in 1970s France and in the 1985 Granada treaty. Specifically, a cultural park enhances the spirit of an archaeological site or promotes conservation work through the public’s education and recreation. Respectively the Treaty of Granada (note 2) supports the idea that architectural heritage and in particular its management is a complex concept whose study should be reduced to the following three levels: town planning, architecture and typology. The aim of the survey process is threefold, the revival of Anavatos being the most important, by placing emphasis on the human factor and the natural environment and also by respecting the history of the entire complex of buildings. In addition, creating a two way relationship between the settlement and the island as a whole would be an important goal, as it could act as a foundation stone for their sustainability. Last, there is a plan for including Anavatos in a network of routes as part of a socioeconomic and cultural process, which would allow the local society to become actively involved, strengthen the local economy and protect the natural environment and the cultural heritage. A basic prerequisite of this survey is an understanding of the historical and socioeconomic bonds that govern Chios as a whole. In brief, Chios can be looked at in three consecutive parts; north, central and south, all with varied features but giving an overall impression of the island’s character, when seen together. The North part is unwelcoming, mountainous and includes a small number of isolated, inland, autonomous settlements. For the most part they are of Genoese origin, a fact proved by the still preserved works of fortification, unlike the private buildings that have been forgotten on account of their cheap construction materials. The urban fabric is loosely designed and the buildings retain their independence by being organized on two floors. The locals are farmers and when there is no land to work on, they become sailors. There are no wide spread commercial activities or export of goods, as for example, to the south part of the island. Kardamyla and Volissos (fig. 2) are important landmarks in the east and west district respectively. The best example of architecture in the north is to be found in Oinousses. Apart from its architectural identity and particular urban planning, the north is of geological interest since the cave of Aghios Galas is located here. The monastery of Aghia Markella near Volissos is also an important religious landmark as it gathers local and visiting pilgrims, while Rimokastro on the plateau of Aipos is a remarkable archaeological site. Last, there are interesting landscapes on the coasts, the main ones being Giosonas, Nagos, and Gyaliskari on the island’s east side. A section of the south part of the island includes the Mastichochoria (Villages with masticha shrubs) (fig. 3). These settlements have developed inland and form an organized and unbroken entity with similar features in their urban planning. The locals are occupied with agricultural work and particularly with the masticha shrubs. There are two conditions explaining both the overall inward looking layout of the villages and their manner of communication: their arrangement on either side of the shrub filled stretches of land and their protection from outside dangers. For extra defence, a network is created of castles, towers, watchtowers and observatories inside each settlement and additionally in key points along the coast. The urban planning is identical in all the settlements and its basic feature is the square or polygonal outer fortress created by the houses themselves forming “a building” whose height only changes where there are towers. These face the four points of the horizon and fulfil two purposes, that of security and of maximizing space. The rest of the houses are located inside this complex with common structural features and a labyrinthine street layout, often leading to a dead end. In the middle of the settlement are the central tower, the small square and the church, which are a material expression of the peoples’ needs, both socioeconomic, defensive and religious. Many religious buildings are situated in this part of the island which create an interesting network of routes. The most important of these is the monastery of Aghios Menas which is linked to the more recent history of the Greek Revolution. 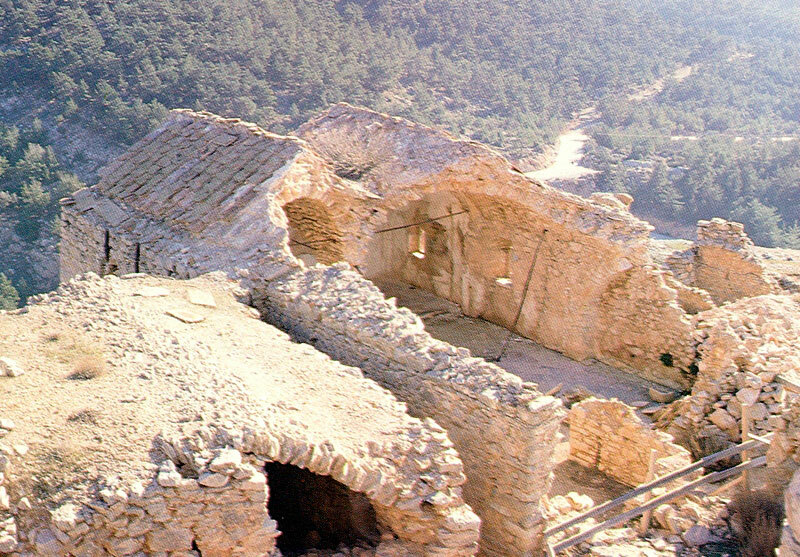 Additionally, in this area there is evidence of the ancient civilization of Chios, as on the Emboreios hill are ruins of a strategically placed settlement of the 8th century B.C. which include a fortified citadel and a nucleus of buildings. Last, southern Chios is known for its special landscapes of which the caves and beaches are the most important. The Cave of Olympoi and the Cave of Lithio are both full of impressive stalactites and stalagmites. The beaches of Emporeios, Kome and Lithio are also interesting because they combine a natural environment with small traditional units for recreation and holidays. Chora, the capital and Kambos which is the island’s second source of wealth are both situated in the central zone. Anavatos also belongs to this area. The town (fig. 4) which constitutes the island’s centre of government, economy and culture is built amphitheatrically in the middle of the island’s east side, facing the Erythraia peninsular in Asia Minor. The historically important Castle has been the heart of the town since the Byzantine era, evolving during the Genovese conquest in accordance with prototypes from Genoa. This period is immensely important for the island, as Genovese interventions both in the socioeconomic system and the urban fabric had an impact not only on the town but on the island as a whole. 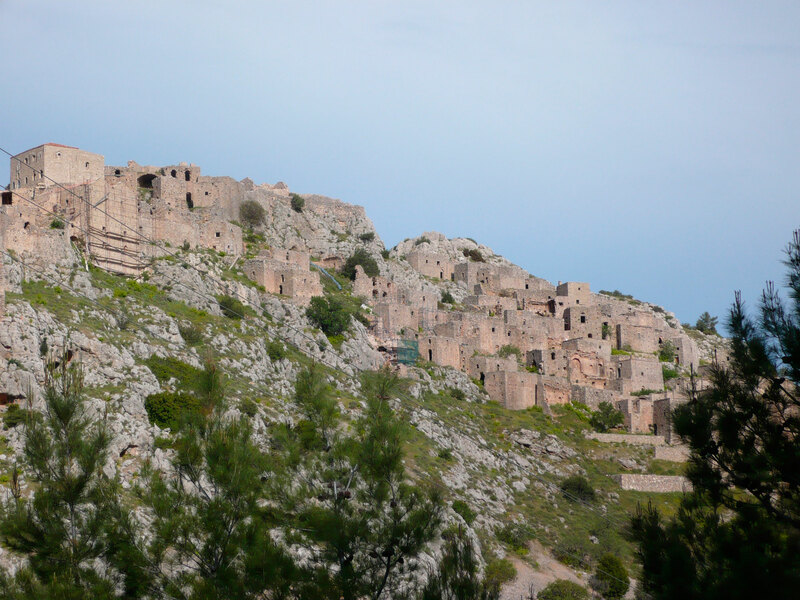 Turkish rule did not alter the look and structures of the town till the events of 1822. The later town was redesigned with neoclassical buildings in the style of Smyrna. The town of today is a modern urban centre retaining, nevertheless, features from the past, such as the Mosque, the Library of Korais and a significant number of isolated buildings on the seafront and the interior. The port acts as the most important bridge for communication, trade and tourism. The Kambos (Plain) is flat, fertile and famous for its impressive mansions that were the country houses of the rich Chiotes and the aristocracy. A special residential complex is created, with labyrinthine road layouts and examples of an exceptional architectural idiom made up of a mixture of eastern, western and local styles. The basic unit of the Kambos is the orchard with its mansion. Citrus fruit are produced all over the Kambos satisfying the population’s needs. The Nea Moni monastery complex forms part of this subsection of the region. Apart from the religious, historical and political role it played in its prime, it was also a centre of agriculture, trade and hospitality. The building complex of Anavatos extends across a rock face 450 m high surrounded by two gorges, creating a strong organic form of 400 buildings directly linked to the dominant natural features of the landscape. It was originally built on the flat stretch of its outskirts. The later “anabasis” (ascent) to the rocky summit was related to defence/military reasons. The primary core of the settlement is an austere walled complex formed by a courtyard and the outer walls of the buildings, covering 800 square meters. In this area is the church of the Taxiarches and the three storey building with the Olive press on the ground floor, the Cistern and the School on the first floor and the church of the Eisodia of Panaghia (The Presentation of Our Lady) (fig. 5) on the one above. This complex was in ruins, with crumbling buildings, lost routes and an unrecognizable urban fabric. Over the last few years the Ephorate of Antiquities has restored parts of the buildings. Towards the end of Genovese rule the settlement expanded to the east and Mesochori developed (fig. 6) to be destroyed during the events of 1822, but only completely abandoned in 1881 after the great earthquake that levelled the whole of Chios. There are very few outdoor spaces and the road network is organized in two parallel axes following the contour lines, with a North-South orientation and a multitude of transverse and smaller parallel road forks. The buildings are small, two storey, mostly with one room and covered by a flat roof supported by an arch. The ground floor is used as storage space or stable, with the family living over it. Both floors can be accessed by an indoor stairway. There is one entrance facing the main network of paths. The windows are always on the first floor and are small, arched and limited in number. The foundations of the houses are interesting as in most cases the walls are founded directly on the rock which can take up as much as half of the ground floor space. The lower part of the town complex is newer and was built after the earthquake by the remaining population. It is different from Mesochori in terms of spatial organization, the treatment of volume and the facades of the houses, as the buildings are larger than they were in earlier times, with two storeys, a tiled roof and free standing on a plot of land. The later church of the Taxiarches is to be found in this district while outside the settlement is the surviving cemetery church of St George with its 16th century frescoes. The proposal to revive the settlement relies on both its being repopulated and on the expanding of activities throughout the island. The redesigning of the residential complex is based on its threefold development. The description of the proposed process includes the phases of the analysis and is specifically organized round the following: the system of routes, the open or built up spaces, the monuments and the functions to be established. The overall plan includes an extended team of young people who will live permanently in the settlement where their daily accommodation needs will be covered, as well as their work, recreation and education so as to become the essential human factor to support all the rest of the activities taking place in the cultural park. Additionally it will organize lodging for tourists by seasonally “renting” the buildings. Specifically, some of the owners will “lend” their houses during high season while being able to stay in them all other times of the year such as during the period of olive gathering. This arrangement will make it possible to collect sums of money to fund the settlement so as to preserve its buildings. The idea of this proposal is to appoint Anavatos as a means of organizing walks and treks all over the island which will draw attention to both the settlement and Chios as a whole. Therefore it is proposed that the character of this residential complex be primarily extrovert, helped by establishing a multiplicity of different functions. The reason for such a thought is the need to give the settlement a character that is more than just local, so as its development can become sustainable. Furthermore, autonomy is a basic prerequisite for organizing the village because of its isolated location. Inside the settlement, the boundaries of semi-public and private space are blurred. This feature was considered as acceptable because of its being a direct link to the village’s past as a fortress. The urban fabric develops on either side of the basic road axis connecting the lower area with the citadel (fig. 5). The process of repopulating Anavatos is the primary step towards organizing the network of treks and routes all over Chios for the development of the two way relationship between the island and the small scale of the village. The term “grid” is used because it has a socioeconomic character unlike “network” which is more technocratic. The treks mentioned above can contribute to the support of the island’s economy through new jobs, the reuse of unlived in residential complexes, and the collection of funds, thus putting an end to the isolation of the village under survey. 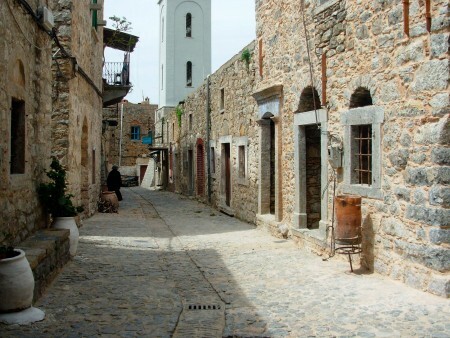 Social tourism is the most direct way of attracting a large number of people and requires many forms of action, most importantly the restoration of both the buildings and urban fabric of Anavatos and additionally installing electricity, running water and telephone lines. In this case the houses restored by the Ephorate of Antiquities are handed over to their owners who can use them as small hotels, places of recreation, local shops or even private houses if they intend to inhabit them on a long term basis rather than occasionally. The reuse of the buildings by private individuals will always take place under the auspices of the Archaeological Service to avoid any actions that may “offend” the historical settlement. This process will most likely have better results when it is contained within a framework of collective social tourism and advertising. In this context, all the rest of the inhabited building complexes of the Mastichochoria and Northern Chios will use abandoned units as accommodation for visitors. An alternative form of social tourism is that of trading associations. Anavatos can function as the geographic and economic merging point of the rest of Chios where examples of local product such as gum from the mastich tree, wine and citrus fruit will be exhibited and processed. Symposiums will be organized as well as exhibitions on local and national gastronomy. Environmental tourism also presents an opportunity for greater profit, this time seen from a geographic point of view. The island offers a variety of contrasting landscapes made up of alternating expanses of mountain, plain and coastline combined with small quaint villages. The enhancement of the natural and manmade environment is made possible by the laying out of routes that will connect the subdistricts as well as stops for information and accommodation. Anavatos can play an important part in this proposal both because of its geographical position and as an example of a human settlement in an unfavourable natural location. Participation in cultural programmes, tourism for educational purposes and religious events can also be added to the previously mentioned proposals. In this case Anavatos can participate actively in drawing attention to the local history, folklore and architectural identity of Chios. The settlement holds a place of honour in this process, as it is the symbol of the island’s political and religious independence, after the great Ottoman destruction. The specific proposal includes the great number of monasteries existing in Chios that took part in the making of modern history. The routes are organized on a North-South axis and extend to the east and west side, incorporating the most basic settlements, elements of ecological interest, religious landmarks and archaeological sites. The shareholders in this project will be the tourists, the holiday makers and those studying history, architecture and the island’s traditions (fig. 8). The east route could be seen as the one that highlights the human factor. 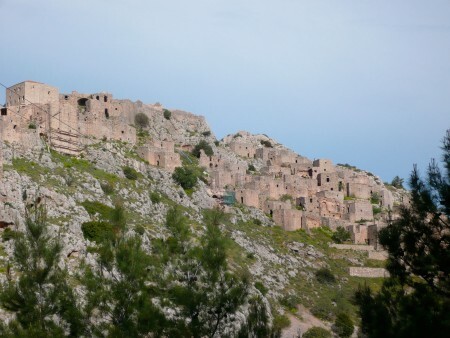 It starts from Kardamyla, the main village in the north east district, then crosses the coastal settlement of Langada and the monastery of Panaghia Myrtiotissa and ends in Vrondados and the archaeological site of Daskalopetra. The group of Oinousses islands are able to access Langada, at a branching out of this route. Another branch leads to the Aipos mountain and the archaeological site of Remocastro. 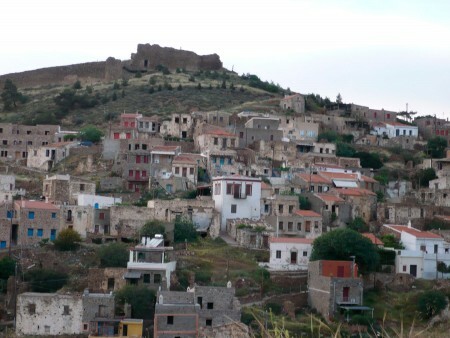 After Vrondados we reach the town of Chios which is the heart of the island. By following an inland route, the next important part of the island we encounter is the urban complex of Kambos with its particular social features. The trek continues towards Thymiana and the monastery of Aghios Menas. From that point on, the trek continues in the direction of the Mastichochoria. A continuation of this route is the archaeological site of the Neolithic settlement of Emporeios with a beach by the same name. In the vicinity is Kome, an important seaside resort during the summer months. The west route could be considered as the one that draws attention to elements of ecological interest such as the caves, beaches and woods of the island. It starts from Volissos that constitutes the largest village in the northwest region. To the north of this route we encounter the monastery of Aghia Markella and the cave of Aghios Galas with the village by the same name. 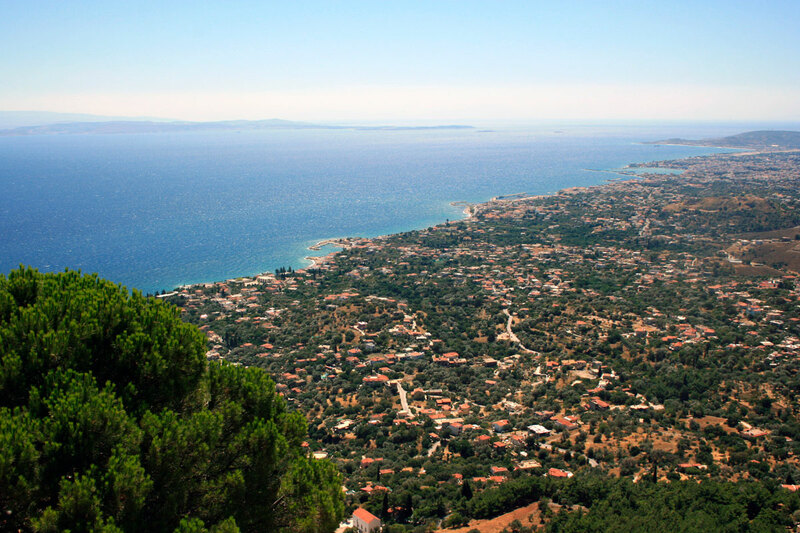 Volissos is followed by the coastal settlements and beaches of Sideroundas and Lithios. Next come the fortified villages of Mesta and Olympoi. Lodgings can be organized there as part of these routes. 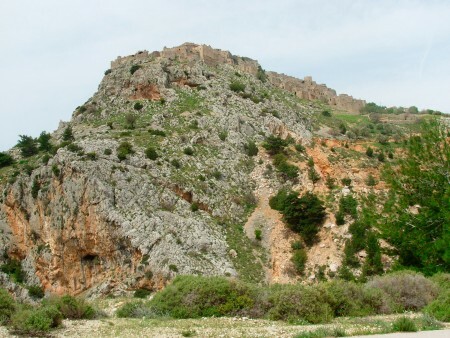 Continuing to the south, we arrive at the cave of Olympoi and the temple of Apollo Phanaios. An interesting fact about these routes is that, each time, they can be used in multiple ways by different users. The transverse connection between the two routes creates a grid which uses Anavatos and its relation to the town of Chios (fig. 9) as a basic component in the organizing, the coordination of activities and of the stops and accommodation. To conclude, the revival and enhancement of a historical settlement should be based on the possibility of the local society’s participation, the strengthening of the local economy and last on the respect towards nature and cultural heritage. In this research process an attempt was made to establish to what extent a sustainable development of Anavatos can be based on its dialectic relationship with the whole of the island. A key prerequisite for this process is that the settlement no longer be given the term “archaeological monument”, but be seen, instead, as potentially a place to be repopulated. In this type of monument, the instruments for the surveying of life and culture are the residents themselves, whether occasional or permanent, as well as the researchers and travellers who should all question the benefits of a wide spread management of historical regions separately and as a whole. In this specific endeavour, vested interests can be seen as long term and it is reasonable for there to be some tension between preserving the past and the need to modernize. Nevertheless, the sustainability of Anavatos is a process that has to start from scratch and in this context, it is possible to achieve a balance between two conflicting points of view by understanding present needs. 1. Andre Malraux (1901-1976) was a great novelist and essayist. He participated in the Chinese Revolution (1923-1927) and was a leader of the French resistance movement. He was a minister in the de Gaulle government. He is considered a controversial figure of French politics and letters. 2. a) The financial-land planning aspect where operations on the historic fabric are made in the light of the sustainability of the settlement and its surroundings, taking into account both the natural and human environment as well as the socio economic relations governing them. The relationship between the historical core being studied and the environment in its broader sense is interactive. b) The urban planning-architectural aspect where the areas to be listed and their integration into everyday life are decided by the surveyors, while respecting their historical, cultural, social and economic value. The revival of the stock of historical buildings should be based on the following improvements: the conditions of the old building stock, the level of both collective facilities and activities, networks of access and traffic. c) The typological- building aspect, where typological quality is assessed as well as the building technology used in the structures. The issues raised are the extent and capacity of techniques used for recovery, restoration, fixing and reconstruction of building complexes, as well as the implementation of new uses and functions, in connection with or breaking away from existing data (Μ. Νομικός, Αποκατάσταση, επανάχρηση ιστορικών κτιρίων και συνόλων, Γιαχούδης, Thessaloniki 2004, pp. 2-4). Αναιρούση Φ. / Μυλωνάδης Λ., Ο Κάμπος της Χίου – Κατοικία και περιβάλλον τον καιρό της ακμής, Ακρίτας, Chios 1994. Αξιωτάκης Σ. Ανδρέας, Ο Ανάβατος της Χίου (ιστορία – τέχνη – λαογραφία), Κ. Ζήσιμος, Chios 1994. Αποστόλου Μ., Αρχιτεκτονική, μορφολογική και αρχαιολογική ανάλυση και τυπολογία Αναβάτου Χίου, Δ.Ε.Π.Ο.Σ. ΑΕ, 2004. Βλαχόπουλος Μ., Αρχαιολογία - Νησιά του Αιγαίου, Μέλισσα, Athens 2000. Γούμενος Κ. / Παπαρούνας Ν., Τα Καστροχώρια της Χίου - η δημιουργία και η δομή τους, Ε.Μ.Π, NTU (National Technical University), Athens 2006. Δουμάνης Ορ. / Oliver P., Οικισμοί στην Ελλάδα, Έκδοση Αρχιτεκτονικών Θεμάτων, Thessaloniki 1973. Καλλιγά Χ. / Μάλλιαρης Α. (eds. ), Θεωρία και πρακτική για την αποκατάσταση ιστορικών οικισμών με σκοπό τις νέες χρήσεις, Πρακτικά Συνεδρίου «Θ΄ Συμπόσιο Ιστορίας και Τέχνης», Μονεμβασιά 20-22 Ιουλίου 1996, Εστία, Athens 2003. Λάββας Γιώργος Π., Προστασία μνημείων και συνόλων (Volume I), Υπηρεσία Δημοσιευμάτων, Thessaloniki 1984. Λαμπρινουδάκης Β. (ed. ), Το έργο των επιστημονικών επιτροπών αναστήλωσης, συντήρησης και ανάδειξης Μνημείων, ΤΔΠΕΑΕ, TDPEAE (Management fund appropriations for Archaeological Projects), Athens 2006. Λούπου-Ρόκου Α.Χ., Αιγαίο – Κάστρα και Καστέλλια, Αδάμ, Athens 1999. Μονιούδη-Γαβαλά Δ., Η πόλη της Χίου – Κοινωνία, πολεοδομία και αρχιτεκτονική, Εθνική Τράπεζα Ελλάδος, Athens 1974. Μπούρας Χ., Χίος, Εθνική τράπεζα Ελλάδος, Athens 1974. Malraux André, Le musée imaginaire, Gallimard, Paris 1965. Νομικός Μ., Αποκατάσταση, επανάχρηση ιστορικών κτιρίων και συνόλων, Γιαχούδης, Thessaloniki 2004. Σκουτέλης Ν. / Ζανόν Φ., Η αρχιτεκτονική κληρονομιά των Οινουσσών, Ναυτικό μουσείο Οινουσσών, Athens 1999. Φιλιππίδης Δ., Νησιά του Αιγαίου - Αρχιτεκτονική, Μέλισσα, Athens 2003.